When you join, please say hello and introduce yourself here. I had the pleasure of meeting some of you (including Dave) a few years at a meet & greet. Well, time flies and the H1 I had, went away. These days I run a 2016 RAM 2500 Power Wagon for light wheeling / desert exploration and a 1995 Jeep ZJ for more technical stuff. The Power Wagon is set up well for HAM radio, with an ICOM IC7000 as my primary (analog) radio and a Motorola XPR 5550 for FM & DMR. I've been wanting to go explore the desert as of late so I'll be checking in on the forum here from time to time to see what's going on. I'll miss the H1 - sorry to hear that. The Power Wagon, however, make a very capable replacement!!! We will have a couple of trips coming up in the new year which may interest you. The first will be to the Parashant and the North Rim in April or May. It will be a 8-10 day trip. The other will be a visit to the East Mojave, probably in January or February. Although it's several months away, we will be doing our annual Field Day in the Los Padres National Forest, where there are several great trails. There may be some other trips, so stay tuned. PS - you might want to consider tuning into our weekly nets. 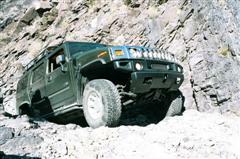 We cover a lot of the information that should interest you for your off-road travels.